It is estimated that a 5% lowering of demand would have resulted in a 50% price reduction during the peak hours of the California electricity crisis in 2000/2001. With consumers facing peak pricing and reducing their demand, the market should become more resilient to intentional withdrawal of offers from the supply side. One afternoon in early 2008, the wind stopped blowing in Texas. A leader in this renewable energy, the state experienced a sudden, unanticipated and dramatic drop in wind power – 1300 Mw in just three hours. An emergency demand response program was initiated in which large industrial and commercial users restored most of the lost generation within ten minutes, acting as a buffer for fluctuations in this intermittent resource. 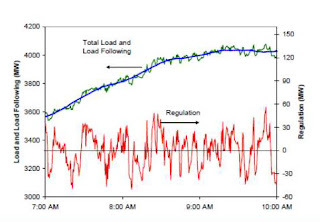 Emergency demand response provides incentives to customers for reducing load during reliability triggered events. These events may also be called in response to high wholesale electricity prices. End-use customer participation in this option is most often voluntary. Upon notification, customers can choose not to curtail and in turn not receive any payment. Usually on-site generators are allowed to participate and supply power during curtailment periods. This option is typically offered by wholesale-market providers such as ISOs and RTOs. However, electric utilities too can offer this as an option to their retail-level end-use customers. Typically, the response time for loads to curtail is two hours. A minimum resource size is specified for participation in this option, which is usually at a level of 100 kW. However, smaller loads can be aggregated to meet the minimum specified size requirement. The participant incentive is in the form of energy payment only, depending on actual curtailment levels during DR events. Participants do not receive any capacity payment. The energy payment is based on either a specified floor price or the market price of energy, whichever is greater. 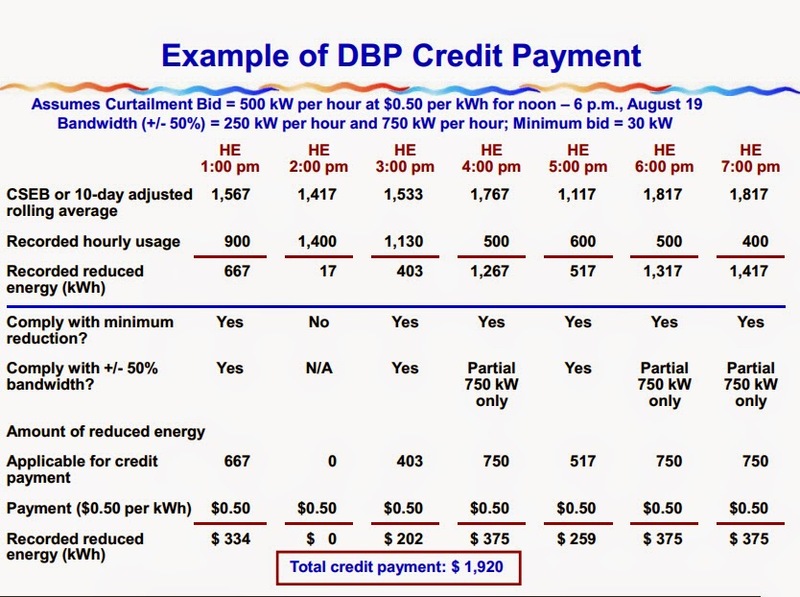 For example, in the New York ISO’s Emergency Demand Response Program (EDRP), participants are paid the greater of $500/MWh or the prevailing location-based marginal price (LBMP) for curtailments. Participants are usually guaranteed payment for a minimum certain number of hours, irrespective of the actual event duration. Since participation in this option is voluntary, there is no penalty for non-curtailment. This option is typically targeted toward medium and large Commercial and Industrial (C&I) end-use customers. Customers need to have interval meter installed for measurement, verification, and settlement. A capacity market DR option is typically offered by wholesale market providers such as ISOs and RTOs. This is the wholesale market analog of interruptible/curtailable tariffs, traditionally offered by utilities to retail customers. Participants in this option commit to provide pre-specified load reductions when system contingencies arise. In return, they receive a fixed incentive payment in the form of capacity credits and are paid to be on call even though actual load curtailments may not occur. Enrolled loads represent a firm resource and can be counted toward Installed Capacity (ICAP) requirements. Since loads represent a firm resource, curtailment is mandatory and there are penalties for non-curtailment. Similar to the emergency DR option, onsite generators are allowed to supply power during DR events. The signal for DR events could either be system emergency or high wholesale market prices. Unlike the emergency DR option, there is a fixed monthly capacity payment for firm load commitment in addition to the payment for energy reduction at real-time market prices with a minimum floor price. Payment to participants is usually guaranteed for a minimum of two to four hours. Typically, for this option, response time ranges between 30 minutes to two hours. Like the emergency DR option, there is a minimum size require for participation, usually in the range of 100-200 kW. Aggregation of smaller loads for meeting the minimum size qualification is allowed. The target segment for this option is the medium and large C&I end-users, the same as for the emergency option. Participants need to have an interval meter in place, along with internet-based communication capability. Act 129 - A Pensylvania law, passed in 2008, which imposed a mandatory one percent cut in electricity consumption from projected figures by 2011. In addition, the Pennsylvania legislature has called for a three percent reduction in electricity use coupled with a 4.5 percent cut in peak demand by May 2013. As a result, Pennsylvania in some ways has become for demand response providers what California or Arizona represent for solar: a large, populous area with utilities that need to sign contracts soon and that other states might begin to copy. Aggregator ( aka Load Response Provider) - In order for an end-use customer to participate in Load Response, they must contract with an aggregator. An aggregator is registered with the Regional Transmission Organization / Independent System Operator (RTO / ISO) or utility, and facilitates communication and program management between the customer and its ISO/utility. Though specific services and requirements vary by region, it is generally the enrolling participant's job to work with the customer to determine the appropriate level of curtailment capability, assist in any on-site equipment requirements, and then complete registration directly with the ISO or utility. Ancillary Services – Required to maintain security and insure reliability of the system Relate to both generation and transmission functions. Baseline – A component of the measurement of energy reduction under a demand response program. During a Load Response event, curtailment of actual load is measured against the baseline, and it is this delta that becomes the basis for the calculation of payments. The methodology for baseline calculation varies by region, and in some cases by electric utility. In New York, the baseline is defined as the Average Peak Monthly Demand (APMD) and is the average of the peak demands between 12:00 p.m. and 8:00 p.m. from the 4 middle months of the prior like season (summer period APMD is the average of the peaks from June, July, August and September of the prior year; winter period APMD is the average of the peaks from December, January, February and March of the prior year). In other markets, a Customer Baseline (CBL) approach is used, which generally involves the highest 3 or 5 days from the prior 10 weekdays, with certain exclusions. In Ontario, it is based on the highest 15 of the prior 20 weekdays, with exclusions. Capacity Payment - $ for standing by. Payment to customer for advance agreement to reduce a certain amount of electric demand upon activation by the market administrator or utility, through an aggregator. CSP - Curtailment Services Providers - Act on behalf of retail electric customers. EDRP - Emergency Demand Response Program – Demand response programs in which response events are triggered by emergencies related to power supply or transmission/distribution. Participation is generally voluntary and payments are limited to energy payments only, which are typically based on the market price reached during the emergency event periods, subject to caps. LMP - Locational Market Price - The market price for energy. A March 2011 FERC rule requires organized wholesale energy market operators to pay demand response resources LMP. LSE - Load Serving Entity - Provides electric service to end-users and wholesale customers. LSEs include the competitive retailers (CRs) that sell electricity at retail in the competitive market. Order 745 – Issued on March 15, 2011 by FERC, established a new approach for compensating demand response resources that participate in wholesale energy markets. In enacting the rule, FERC recognized that the Energy Policy Act of 2005 required the elimination of unnecessary barriers to the participation of demand response resources in the organized wholesale energy markets, and that those markets function most effectively when both supply and demand resources have appropriate opportunities to participate. Under Order 745, the individual organized wholesale energy market operators—otherwise known as an Independent System Operator ("ISO") or Regional Transmission Organization ("RTO")—are required to pay demand response resources the market price for energy, known as the locational marginal price or "LMP," when a two-step test has been met: (1) the demand response resource has the capability to balance supply and demand as an alternative to a generation resource; and (2) the ISO or RTO dispatches the resource when it is cost-effective to do so. With respect to this second requirement, FERC determined that it would be cost-effective to pay the LMP to demand response resources when a "net benefits test" concludes that the benefit to electric customers from the reduced LMP that results from dispatching demand response resources exceeds the cost of paying LMP to those resources. Since this is a factual determination, FERC required each ISO and RTO to establish a net benefits test to determine when it is cost-effective to dispatch demand response resources in its organized wholesale energy market. Order 745 requires each ISO and RTO to make a compliance filing, which is required to include conforming tariff provisions and identify price thresholds to estimate where net benefits to customers would occur, with FERC by July 22, 2011. 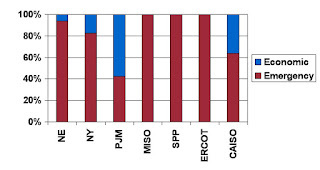 In addition, each ISO and RTO is required to conduct a study that examines the requirements for and effects of directly determining the cost-effective dispatch of demand response resources in both the day-ahead and real-time energy markets, and to file the results of the study with FERC by September 21, 2012. PDR – Proxy Demand Resource - PDR functionality will allow Demand Response to participate in the CAISO’s energy markets on a basis that is comparable to generation as required by FERC’s Order 790, and it will set a proper foundation for Demand Response to participate in the CAISO’s ancillary services markets as well. PDR can help ensure that Demand Response marketing and implementation efforts are directed at grid locations where it can provide the most benefit. Finally, by tying the operation of Demand Response to market incentives rather than “events” with artificial triggers, PDR can accelerate adoption of and Demand Response technologies that shift load away from the peak (e.g. storage) as well as technologies that simply reduce load. Penalties – Each ISO administers its own version of Load Response with specific and unique rules and regulations. Penalties related to non- or under-performance may result in a reduction in future payments, or may involve a financial penalty. Penalties are program-specific and vary widely. PLP - Participating Load Pilot projects - Being developed by each of the three California's investor owned utilities ("IOUs") through a process being conducted by the California Public Utilities Commission ("CPUC") as part of an overall effort to consider how to reshape utility demand response programs to best align with the ISO's new markets. 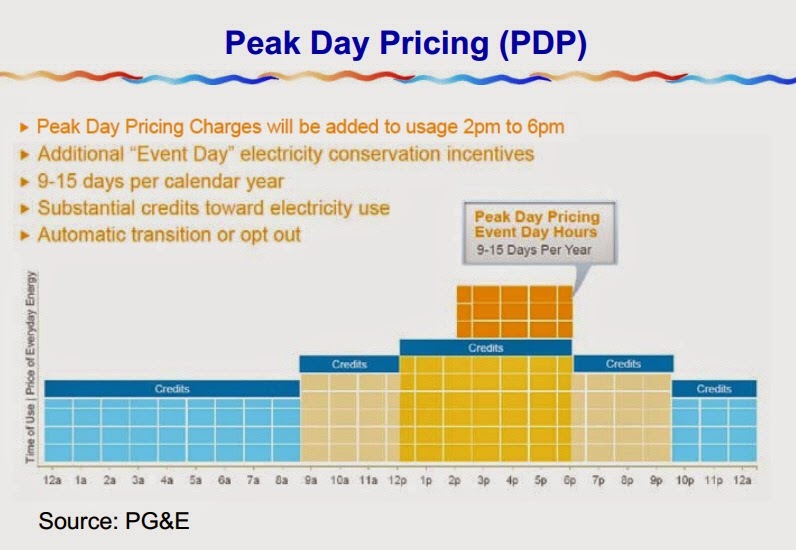 Specifically, the PG&E pilot project is intended to explore the feasibility of aggregating end use customer loads so that they may provide ancillary services, specifically non spinning reserves, to the ISO in the form of economically bid demand response resources. RIP – Responsible Interface Party - A demand response service provider, authorized by the New York Independent System Operator (NYISO); also called Curtailment Service Provider (CSP) or Demand Response Provider (DRP). Settlement - The process by which a customer receives payment for their participation in Load Response. The Load Response provider measures and verifies data from a Load Response event, which is sent to the ISO or utility to become the basis for payment. The Load Response provider then receives compensation directly from the ISO or utility and distributes it accordingly to customers. In some markets, payment can occur even without an actual deployment event. Though payment structures vary by region and type of Load Response program, a customer typically receives payment following settlement in the form of either a check, automated wire transfer or bill credit. This may occur monthly, quarterly, semi-annually, or annually. In March 2011, the Federal Regulatory Commission (FERC) established a new rule intended to benefit customers and help improve the operation and competitiveness of organized wholesale energy markets by establishing the approach to compensation for demand response resources in those markets. According to FERC, the new rule will help ensure the competitiveness of organized wholesale energy markets and remove barriers to the participation of demand response resources in those markets. The rule requires organized wholesale energy market operators to pay demand response resources the market price for energy (LMP), when those resources have the capability to balance supply and demand as an alternative to a generation resource and when dispatch of those resources is cost-effective. The order finds that it will be cost-effective to pay that market price for energy to demand response resources when a net benefits test shows that the benefits to load from the reduced LMP that result from dispatching demand response resources exceed the costs of paying LMP to those resources. The rule requires RTOs and ISOs to meet specific requirements for the establishment of the net benefits test to determine when demand response resources are cost-effective. The final rule recognizes that in the Energy Policy Act of 2005, Congress established a national policy to eliminate unnecessary barriers to demand response participation in organized wholesale energy markets. In approving the new rule today, FERC continues to recognize that markets function most effectively when both supply and demand resources have appropriate opportunities to participate. Organized wholesale market operators will be required to make compliance filings by July 22, 2011, that include conforming tariff provisions and identify price thresholds to estimate where customer net benefits would occur, and thus above which it would be cost-effective to dispatch and pay demand response resources the market price for energy. By September 21, 2012, each market operator must undertake a study examining the requirements for and effects of directly determining the cost-effective dispatch of demand response resources in both the day-ahead and real-time energy markets, and to file the results of the study with FERC. Increased Regulation may be required because variable generation patterns will make it difficult to maintain grid operations and reliability As a solution to the variable nature of renewable generation, it is believed a need for additional regulation will be required on the grid. Dynamic demand devices have the potential to save considerable amounts of energy by the services they provide. But before dynamic demand control can be widely incorporated regulation must be put in place to mandate installation on at least new appliances or an effective market mechanism must be created to reward installation of the technology fairly. One method contemplated is to enable the electricity meter that measures the electricity consumption also measure the grid frequency, and switch to a higher tariff if the frequency drops below a certain level. The monthly electricity bill will then say that so many hours (and so many kilowatt hours) were on the Regular tariff and a few hours on the Short Supply tariff. Those consumers without smart demand management have to pay the extra cost, but those who install smart technologies that adapt to the short supply periods will save money. Hourly blocks of reduced power demand is a resource traded in an open wholesale market overseen by the CAISO called “ancillary services.” In this market, utilities can trade reduced power use at certain hours on certain days in the near future to help even out the demand for power in the state. For each facility, hourly demand for power, and demand savings, are forecast two days ahead and submitted to the CAISO the day before the operation. The demand savings is an available resource that is traded in the ancillary services market. These savings from demand response resources are optimized against all other generation resources in the ancillary services market. Residential Demand Response Market Immature – Residential demand response has yet to prove that it works. Residential demand response involves millions, not hundreds, of clients, each using far less power individually than big commercial and industrial facilities. And that has led some backers of so-called "C&I" demand response to question whether the residential market is ready to deliver. However, a few demand response aggregators – Comverge and Cooper Power Systems among them – have been helping utilities press into the field of residential demand response. DR Benefit Equity - The March 2011 FERC rule requires organized wholesale energy market operators to pay demand response resources the market price for energy, known as the locational marginal price (LMP), when those resources have the capability to balance supply and demand as an alternative to a generation resource and when dispatch of those resources is cost-effective. Utilities that had been doing cost-benefit analysis on demand response in terms of justifying the cost to implement and administer demand response now have had the benefit significantly reduced. Some may argue that it is the all for the customer's anyway so it doesn't matter, but there are some entities that may receive a relatively larger portion of the DR benefit and end up underpaying a proportionate share of the cost. Retail Market Management – ISO’s focus on wholesale market activities and would like to distance themselves from retail market activities, The rules by which payments from the CAISO for verified Demand Response are divided amongst CSPs and LSEs still need to be established. One way to accomplish this is via bilateral negotiations between CSPs and LSEs, but bilateral negotiations are time-consuming and will lead to a patchwork of arrangements that are unlikely to be equitable, consistent or satisfactory to CSPs, LSEs, consumer advocates or the CPUC. LSE/Customer/CSP Settlement Process - The CAISO’s PDR design discusses cash flows between the CAISO and other parties (CSPs, customers, LSEs) in general terms but it does not discuss a likely exchange of cash flows among CSPs, LSEs and customers that must also take place. Under PDR, compensation at the applicable LMP for verified load reductions is paid directly to a CSP, which shares that compensation with its customers. LSEs have their day-ahead schedules adjusted to reflect these verified load curtailments so that they are not required to settle with the CAISO for uninstructed energy (UIE). Aggregated Baselines - The CAISO “proposes to determine performance versus baseline on an aggregate basis rather than by calculating each end-use customer’s baseline versus actual and summing the results.” Measuring the performance of the portfolio rather than measuring individual performance imposes a significant barrier to customer participation because it ties each customer’s compensation to the performance of the portfolio rather than allowing each customer to be compensated based on its own performance. A very large customer that cannot or will not perform on a given day could overwhelm perfect performance by many small customers in the same portfolio. Once customers understand their compensation for Demand Response could be negatively impacted by the performance of other customers over which they have no control, they either quickly lose interest in signing up, or they drop out. IT infrastructure - Changes are significant. Tariffs - Some charge (or credit) different amounts solely based upon geographic location. FERC Authority to Regulate DR - On June 6 several industry groups filed suit with the U.S. Court of Appeals for the District of Columbia Circuit asserting the commission “has attempted to circumvent” statutory limits on such authority. Petitioners include The National Rural Electric Cooperative Association (NRECA), the Electric Power Supply Association, American Public Power Association, and Edison Electric Institute, and Old Dominion Electric Cooperative. They oppose FERC Order 745, which treats DR as "the functional equivalent of producing energy for sale at wholesale," according to the complaint. The petitioners contend that FERC's order tries to circumvent laws that bar it from regulating retail power sales. They also claim the order over-compensates DR providers. Finally, petitioners argued, the commission unlawfully imposed the new rate mechanism without first demonstrating that existing rates were unjust and unreasonable, as required by the Federal Power Act. Transparent market prices for a variety of products used by wholesale electricity markets (i.e., capacity, energy, and ancillary services). Transparent market prices make it easier for customers and demand-response providers to calculate the value of their demand-response capability. Diversity of participation with the entire range of participants, including individual customers, utilities, demand-response providers or aggregators, who are all able to participate in organized markets. ISOs and RTOs make it easier for all types of demand-response resources to participate in efficiently meeting load. Reduced barriers to market entry and lower transaction costs because of well-defined demand-response products, standardized rules, and common communication and meter data submission protocols. Large, liquid markets that can accommodate a significant amount and variety of demand-response resources. Authorizes the aggregator to act on their behalf, and to obtain billing records, billing history, and all meter usage data, etc. Comverge (NSDQ: COMV) East Hanover, NJ - With over 500 U.S. utility clients and 4.5 million devices installed, Comverge "smart megawatts" technology is widespread and in use across the nation. Their "pay-for-performance" programs provide capacity that can reduce emissions, eliminate line losses, increase reliability, and defer generation and transmission acquisition. In April 2007, Comverge (COMV) became one of the first publicly traded companies that could be described as a pure-play smart grid company. 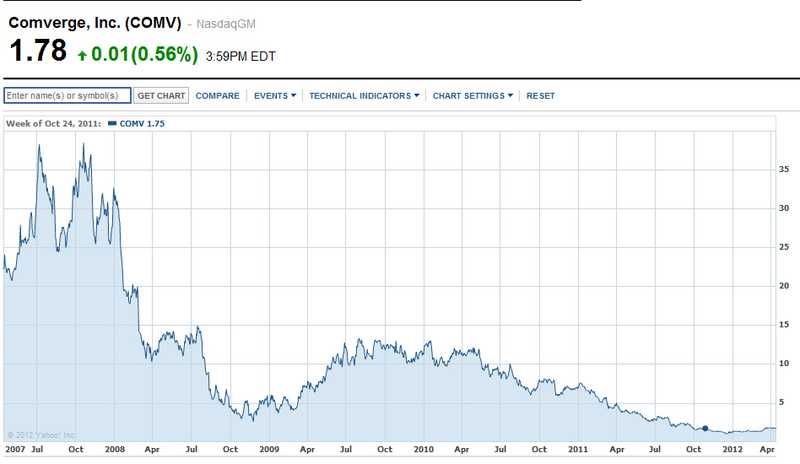 On Monday, March 26m, 2012, Comverge ended that experiment on the public markets with a sale to H.I.G. Capital for $49 millionon, a fraction of the market value it commanded just 18 months ago. As a provider of demand response services, it allows utilities to cut power use in homes at peak demand times using one-way pager networks, and has installed in-home energy displays, smart thermostats and digital controls in projects with more than 500 utility customers. In a nod to the emerging dominance of smart meters and broadband connections as pathways to the home, Com verge has also launched software aimed at giving utilities a platform to monitor and control systems based on both modes of communication. Now that Comverge has solved its immediate debt financing and cash crisis, it has a year or so to prove it can achieve a key milestone and turn cash-flow positive on an annual basis. By 2013, the Norcross, Ga.-based company wants to show a first-ever annual profit. Analysts agree that Comverge's 2011 fiscal year results released in March contain impressive growth in its commercial and industrial customer base, although its residential business has languished. It's also launching new projects like the creation of a demand response market for South Africa utility Eskom. Still, Comverge's sale to H.I.G. highlights a key problem the company may have faced in maintaining a balance sheet strong enough to play in its chosen market. Demand response aggregators have to bid on contracts in key markets like that of mid-Atlantic grid operator PJM and others. Comverge needed money just to participate in those auctions, and Monday's news of an immediate $12 million in debt financing should tide over those concerns. But beyond its short-term problems, the company has struggled for years to keep up with its rivals in the demand response space - namely, big U.S. rival EnerNOC (ENOC), which went public one month after Comverge. Comverge had 4,564 megawatts under management at the end of 2011, compared to the more than 7,000 megawatts under managementEnerNOC had racked up as of late last year. 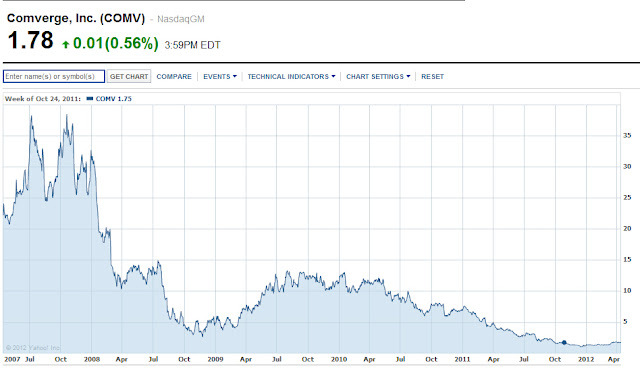 The two had been virtually tied on market share up until 2009 or so, when EnerNOC began pulling away. In 2010, CEO Blake Young was hired to restructure the company and bring it up to speed. But first, he had to manage a crisis, when the company was forced to recall communications modules inside the radio-controlled home thermostats it had deployed with Texas utility TXU, over fire hazard concerns. That ended up affecting most of the company's utility customer base, Young said in the company's March 16th conference call. While the company has grown residential business by 21 percent in 2010 and 14 percent in 2011, the end of a contract with NV Energy was enough to push residential megawatts under management from 1,287 to 1,134 in the fourth quarter. In the meantime, Comverge has been growing its share of commercial and industrial customers, and added 800 megawatts overall last year. But it's also facing tough competition from the likes of EnerNOC, Constellation Energy, Honeywell, Johnson Controls, ViridityEnergy and ConEd Solutions, to name a few big C&I demand response contenders. Still, analysts covering the company pointed to strong fourth-quarter C&I revenues of $10.2 million, double those from the same quarter a year ago, as a sign that the company was far from out of the game. Constellation New Energy – Baltimore, MD – A unit of Constellation Energy, a major generator of electricity with a diversified fleet of generating units located throughout the United States. Provides a secure, web platform called VirtuaWatt that allows customers to schedule load in the economic Demand Response programs. In the synchronized market, it allows a customer to nominate load on an hourly basis and informs them if they have been awarded and/or called for a Demand Response event. In the day ahead and real time markets, it allows customers to bid load and prices into the market. CPower – New York, NY- Serves commercial and industrial clients. Enables optimization of facilities and operations through strategic energy reduction initiatives and earns market payments for those reductions. The privately held company raised over $10 million this year in early stage capital to accelerate innovation and recently landed an undisclosed investment from Intel Capital. CPower will be part of Intel's Open Energy Initiative. It would be no surprise if expansion capital was raised next year to access new geographies and verticals. CPower, which was founded as ConsumerPowerline in 2001 and changed its name in 2008, has gathered a portfolio of about 2,200 megawatts under management. Earlier this year it landed a 200-megawatt demand response contract with Maryland utilities Allegheny Power, Delmarva Power and Light Company and Potomac Electric Power Company (PEPCO). ECS - Energy Curtailment Specialists, Buffalo, NY (California Office – SF) - The largest private demand response provider in North America, offering turnkey, administrative and a la carte demand response services. EnerNOC (NASDAQ: ENOC) Boston MA - A leading demand response and energy management solutions provider for commercial, institutional, and industrial customers, as well as electric power grid operators and utilities. EnerNOC, founded in 2001, has begun to shift its focus from solely that of a demand response player to a total energy management firm (pulling in revenue from both utilities and C&I customers) EnerNOC continues to increase the amount of megawatts under management (now more than 3 gigawatts). Recently, EnerNOC had a quarter where they earned in excess of $100 million. Johnson Controls (NYSE: JCI), a global leader in building systems management, completed its acquisition of EnergyConnect (OTCBB: ECNG)– Campbell, CA - on July, 1, 2011 in a cash deal totaling $32.3 million. EnergyConnect is best known for GridConnect, its software platform for enhancing electrical-grid efficiency, especially in the cases of regional shortages or peak pricing changes. The move is anatural fit as the tech start-up provides a ready-made offering in grid technology services for existing customers of the parent company, while that parent company opens up a far-reaching global client list to its smaller tech counterpart. The acquisition enables Johnson Controls to help building owners and operators manage how much energy their buildings consume and when the energy is consumed – a critical feature of connecting smart buildings to the smart grid. EnergyConnect pays large industrial, commercial, educational and municipal organizations to temporarily reduce a portion of their energy when electricity prices are high or when the power grid experiences a shortage. As a result of the temporary reductions, there can be substantial cost savings on the energy bill. EnergyConnect has captured the PJM market and has a secondary focus on California. Their technology really does two things: It monitors electricity prices, which change on a very active basis -- every five minutes and across various zones -- and it takes those prices and matches them against a customer’s load profile. Connectivity Week 2009 Integrated Emergency Management OASIS Integrated Emergency Management (EM) Sessions examine how standardized Information and Communication Technology (ICT) supports the end-to-end EM Lifecycle within the evolving SmartGrid. Integration requires all parts of EM to work together for secure reliable information sharing. This series looks at how existing and emerging standards can accomplish this integration. CAISO Design for Proxy Demand Resources (PDR)- Comments of EnergyConnect, Inc.